See video below for sound, this is a gif. You could do gravity sorting. MSD radix sort is wrong for some sizes with input n-2 equal. Binary insertion sort over-inserts the equal elements, making n-2 equal quadratic. Please correct this 1-off error. It was also made a video. I don&apos;t see much point in the input types, you can check out the code and try these yourself. One can add many different types of inputs. There is no release schedule. Releases are quite a hassle to make, but once enough additional algorithms are added in the git repo, I&apos;ll make new binaries. Could you add ascending/descending cubic and quintic input types? When do you plan to push to a new downloadable executable? Just wondering. @Dan: thanks for the bug report. It&apos;s fixed in git now, the number of radix rounds needed was too low for n=4^k. Radix sort LSD gives incorrect results every time with array size 12 and shuffled cubic or quintic as source on linux version. Yes, well, I don&apos;t have Windows 8.1. I found something about high-resolution timers for Windows 8.1 and later. Would be great to have the < 1 ms resolution. @mgutt: that sounds like a very good idea. I&apos;ll replace the "Random" button with Shuffle/Reset in the next version. @Page: Execution time analysis of sorting algorithms is really difficult. It depends on many parameters like hardware, input and implementation. It is really outside the scope of SoS, which is primarily an educational tool. Have you done any kind of comparison statistics of total computing time vs array accesses/comparisons? Those would be pretty cool. It would be nice if the "Reset" button simply reverted the array to its presorted state, not mix the elements. That way, it is possible to see different sorting algorithms being performed on the exact same array. To mix the array, you could add a "Shuffle" button. Please add Timsort, Stooge sort, and slow sort to the demo program. This program is so amazing to me. TimSort is already implemented on git. Wouldn&apos;t KraaySort violate a patent? I can&apos;t find any implementation. The sound in that andrut video has clearly been done by modulating the cutoff point of an analog-like filter, over a toothy waveform. Maybe a fixed high saw waveform or something like that. I might be wrong, but the filter might also be the rarest one in analog synthesis: the band reject one. Upon your requests: added TimSort, Slow Sort and Stooge Sort (see github). Videos about them are also on Youtube now. Posted on 2013-05-22, last updated 2014-05-15 by Timo Bingmann at Permlink. Sorting algorithms are an essential chapter in undergraduate computer science education. Due to their easy to explain nature and fairly straight-forward analysis, this set of algorithms offers a convenient introduction to the methods and techniques of theoretical computer science and algorithm analysis. 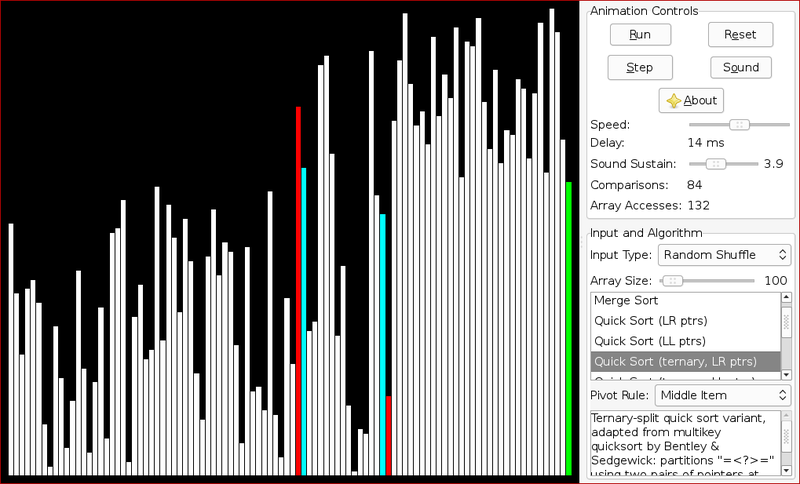 This web page presents my own demo program for sortings algorithms, called "The Sound of Sorting", which both visualizes the algorithms internals and their operations, and generates sound effects from the values being compared. See below for YouTube videos created with the demo. All of the sorting algorithms are implemented in the SortAlgo.cpp. Since November 2013, there is also the SoS-CheatSheet.pdf , which contains pseudo-code of a small selection of the algorithms. See the README file below for information about using the program. There are many resources on the Internet about sorting algorithms, among them are Wikipedia, animated sorting algorithms by David R. Martin and various Java applets by many college or university staff. However, one of the most intriguing demos of integer sorting algorithms is the visualization and "audibilization" by andrut, available in a YouTube video. However, there is not a whole lot of technical information available about how sound is generated from the sorting algorithms&apos; operations. According to the YouTube comment, there have been two previous approaches to generating sound from sorting: first and second. Both are constrained by using MIDI notes and slow instruments. Andrut&apos;s is the first good sound generator, and it was the main guideline for the sound effects in the Sound of Sorting. However, for use in undergraduate teaching the YouTube demo has a lot of drawbacks. Most importantly, it cannot be slowed down! It also contains little additional information about how the algorithms operate. Furthermore, the set of algorithms is very small and some are not as good as they could be. Thus I decided to create my own for the algorithms course we were teaching in Karlsruhe in 2013. The demo program is published under the GNU General Public License v3 (GPL), which can also be found in the file COPYING. A few of the sorting algorithms&apos; implementations were written by other authors and may have different licenses. The following YouTube playlist contains almost all sorting algorithms implemented in the demo program. They are grouped and ordered according to their exchanging techniques. The YouTube videos are published under the Creative Common Attribution license . The Sound of Sorting demo program is very intuitive to use. It contains many sorting algorithms, which are selectable via the list box on the right. For the quick sort variants the pivot rule can be selected separately. When pressing "Run", the algorithm is started on selected input. "Step" will stop a running algorithm, or start a new one, and halt it after performing one operation. With "Reset" a running algorithm is stopped, and a new random input is created. When "Sound" is activated, the program will generate sound effects on the default audio output. The "Speed" slider changes the algorithms execution speed by adding a delay for each array access. Due to the 1ms resolution of timers on Windows, the speed scale is smaller. The Linux version has a higher time resoltion < 1ms! The algorithm&apos;s visualization contains mostly white bars representing the value of the array position corresponding to the x-axis. When the algorithm gets or sets an array item, the white bar runs red for one algorithmic step. A swap operation is represented by two bars turning red and their values being exchanged. Some algorithms specially colorize bars which represent indexes, pointers or other information about the internal mechanisms of the algorithm. Both value comparisons and array accesses are counted and shown in real time. The comparison counter includes ternary comparisons as just one operation. Due to algorithms often using extra memory or local variables, the array access counter highly depends on the actual algorithm implementation. 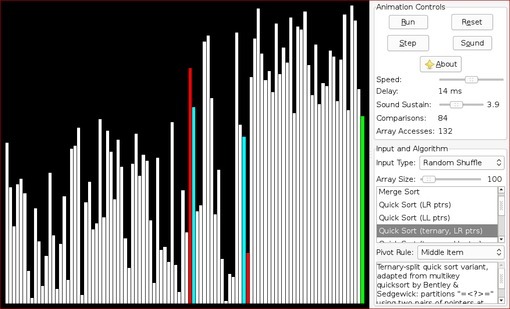 The generated sound effects depend on the values being compared. Only comparisons yield sound output (except for in radix/bucket sort)! The length of each comparison&apos;s sound effect can be modified using the "Sound Sustain" slider. The frequency of the sound is calculated from the compared values. The sound wave itself is triangular and modulated with an ADSR envelope. This yields the "8-bit game tune" feeling. An item value is scaled (with double precision) to the frequency range 120 Hz - 1,212 Hz, which is large but not too high to be annoying. The demo program uses the wxWidgets toolkit for cross-platform dialogs and painting. For sound output, the audio component of the cross-platform SDL library is used. All sources resides in src/. The main window&apos;s GUI functions are grouped in WMain.h/cpp. The sorting visualization, including the instrumented array class and painting methods are in WSortView.h/cpp. SortAlgo.h/cpp contains all sorting algorithms. These were mainly modified to operate on a WSortView object, which exposes most of the usual array operators such as operator, and many special functions to create nicer visualizations. Most notable among these, are a special swap() function and mark() to colorize bars. There is also watch() to do live tracking of indexes stored as local variables (use this with care)! Comparison counting and sound effects are signaled by the operators of ArrayItem, which is the item class of the instrumented array WSortView. As such, all comparisons of the sorting algorithms will be intercepted by this class. On each comparison, the values are used to generate sound. All sound generating methods are in SortSound.cpp. The main class here is an Oscillator, which generates an enveloped triangular waveform of a specific frequency. Oscillators are mixed together for the output sound. The output volume is scaled automatically depending on the number of oscillators active. For (somewhat) rapid development with wxWidgets, the wxGlade dialog generator tool is use. The public version of the Sound of Sorting contains no recording facilities. If you want to contribute a sorting algorithm, please notify me. New sorting algorithms: Binary-Search Insertion Sort, Block Merge Sort (WikiSort), Cycle Sort, Dual-Pivot Quick Sort. Displaying current number of inversions and runs in array. Microseconds delay on Win32 using QueryPerformanceCounter(). Renaming array from a to A for easier reading and matching to SoS-Cheatsheet. Fixed compilation with older compilers and on Mac OS X.